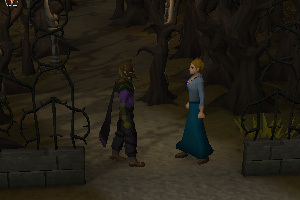 Begin by speaking to Veronica located south of Draynor Manor. 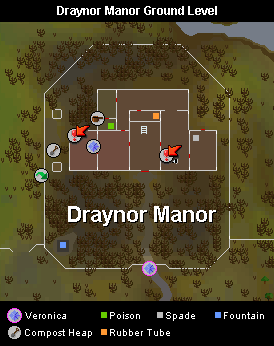 First off, head to Draynor Manor, located just north of Draynor Village. Speak to Veronica who will be wandering around just south of the manor, near the entrance. She explains that she and Ernest, her fiancé, were lost, and Ernest decided to go into the manor to ask for directions That was an hour ago, and Veronica is worried! Tell her that you will help her find Ernest. Continue north along the path until you reach a large building and go inside. Climb the stairs located directly north of the main entrance, and then climb the nearby Ladder up to the second floor. Talk to Professor Oddenstein, the eccentric-looking scientist in the room, and ask him about Ernest. The Professor says that he has turned him into a chicken during one of his experiments. Tell him to change him back, and he says that his machine is broken and he needs several parts to get it running again. He needs a Pressure Gauge, a Rubber tube, and an Oil Can. With the list of needed items to get the machine running again, climb down the ladder to the first floor. 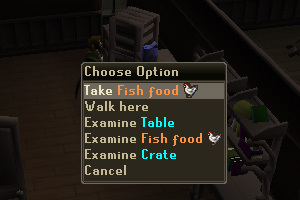 Now enter the room directly south of the stairs and take the box of Fish Food from the table. Leave the room and climb down the stairs leading to the ground floor. Now enter the kitchen in the northwest corner of the mansion. 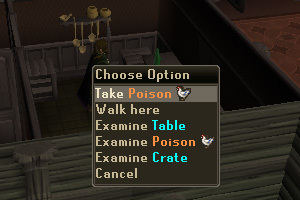 South of the range is a closet where you can find a bottle of Poison which you should take. Now leave the kitchen and head into the eastern-most room where you will find a Spade on the floor in the northwest corner. Take the Spade and leave through the northern door. Walk around the Mansion, to reach the western side of the grounds. 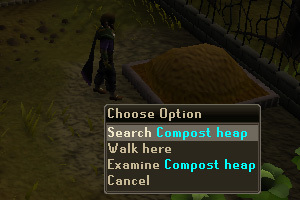 You will come upon a Compost Heap which you can Search to find a Grimy Key . Continue to the southwest corner of the grounds until you reach a Fountain filled with vicious Piranhas. 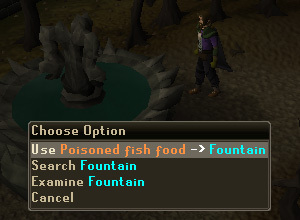 Use the Poison with the Fish Food to poison it, and then use the Poisoned Fish Food with the Fountain to kill the Piranhas. Search it to find the Pressure Gauge. 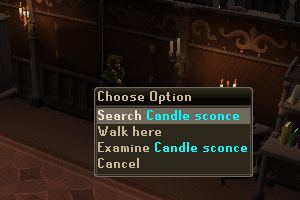 Now head northeast and go back inside Draynor Manor. 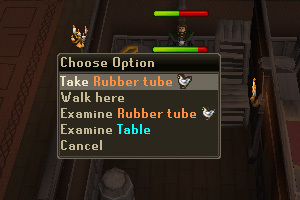 Just north of the staircase is a small room where you will find the Rubber Tube, as well as a level 16 Skeleton guarding it. Simply run inside, take the Rubber Tube from the table, and then leave the room. Enter the room to the west of the main entrance room, and then search the Candle Sconce on the western wall to find a secret door. Now climb down the ladder into a basement filled with small rooms and levers on the walls. This is the tricky part of the quest, and you need to pull the levers in order and continue into the correct room. To help you with this quest, here is a map of the maze with the levers and doors which you can follow. Pull levers A and B up. Go through doors 2 and 3. Pull levers A and B down. Go through door 3, 4 and 5. Pull levers E and F up. Go through door 6 and 7. Go through doors 7 and 6. Go through doors 6, 8 and 3. 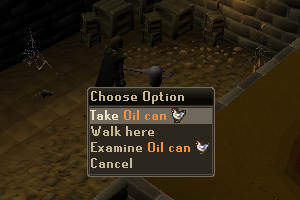 Now you can go through door 9 and pick up an Oil Can. Now go back up the ladder and pull the lever on the wall to open the secret door up. 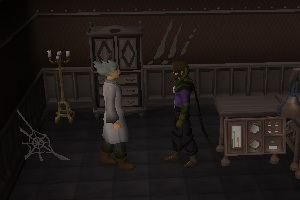 Head back upstairs to Professor Oddenstein and give him the parts to the machine. He'll fix it and turn Ernest back into a human, who will thank you for helping him. 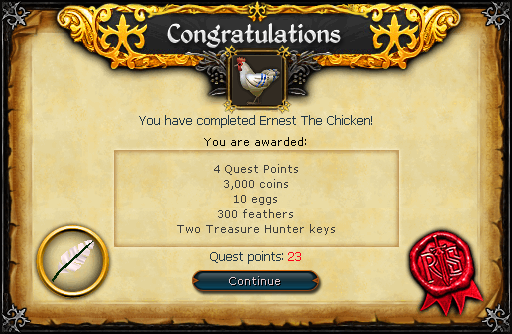 Congratulations, you've finished the quest! [^] Solve your way through the maze.